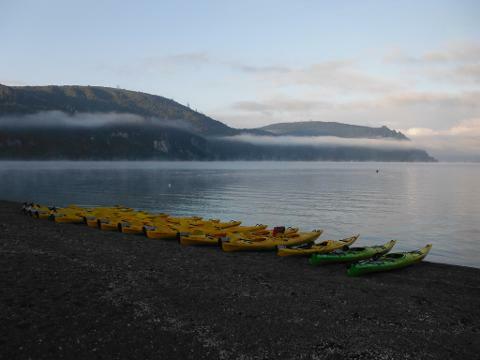 In one day, you will enjoy a leisurely 2.5 - 3 hour mountain-bike ride, and a 2.5 - 3 hours kayaking on the crystal clear waters of Lake Taupo. You will meet us at our base in Acacia Bay, where we will load your bike then set off by road to Whangamata road car park, to ride Orakau and K2K (kawakawa Bay to Kinloch) section of the Great Lake Trail. 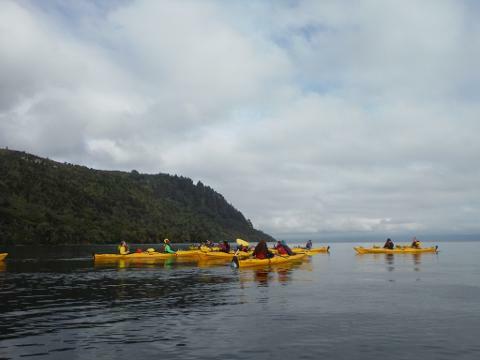 During the ride you will stop of at Kawakawa Bay for a break - Sit on the nice fine stoney beach, enjoy the crystal clear waters, listen to the breeze in the Kawakawa trees along with the Tui birds, Tomtits, Fantails, and other native birds. Look out over our beautiful lake and ponder how it all came to be. You may even see a rock climber scaling the cliffs. Before you set of to Kinloch. Orakau.The trail starts by weaving in and out of pine trees and through gullies. There are a couple of boardwalks with excellent views of the Orakau wetland/stream valley with the pastureland visible on the nearby rural hillsides. With the lake and mountains out of view now the trail rolls in and out of bush and Harakeke (flax) wetland areas. Traversing the sides of this small valley the trail climbs to a wide bridge (without handrails) to cross over the stream. You will continue to descend through the Orakau Stream valley and through native regenerating bush till you reach a couple of bench seats from where there are stunning views of the volcanoes of Tongariro National Park just south of Lake Taupo. Once you've had a rest and taken in the view, the trail continues on under lush ponga tree fronds before crossing two bridges. Before long you will be aware that you are actually riding on the beach, which is now covered in bush, as you feel stones under your tyre treads! The trail continues along parallel to the beach for a while before emerging onto the beach at the stunning Kawakawa Bay. 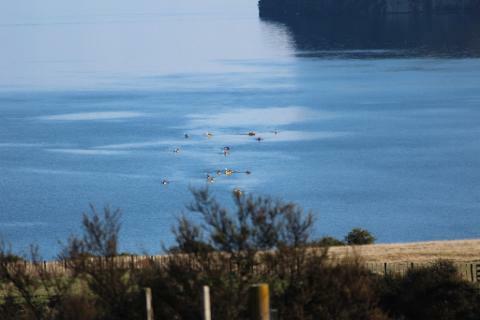 K2K (Kawakawa bay to kinloch). Trail: Kawakawa Bay the trail climbs up through native bush to the Te Kauwae headland. The highest elevation of the trail is reached at about 3km where there is a rock lookout over a stunning view of Kawakawa bay. There is no mistaking how this bay got it's name with all the Kawakawa trees below. On the left of the panoramic view some cliffs can be seen that are often used by rock climbers. The far west bays of Waihaha and Waihora can also been seen. If you are riding on one of our expeditions it is also interesting to note that Mt. Pureora (of the Pureora Timber Trail) can be seen on the western horizon if it is a clear day. This lookout rock is the most photographed point on the whole Great Lake Trail. Now the descent begins! It's a long, flowing, fun, and exhilarating ride down to the Otaketake Stream bridge, then onwards over a small bridge that crosses the Whangamata Stream. (This point is the junction of the Whangamata Stream Trail that goes up to Whangamata Rd). The final section heads east on a grassy path just a few metres up from the sandy beach, then merges onto the lake front opposite the Kinloch Store. It's here on the beautiful beach or under a tree at Kinloch that your gourmet lunch awaits you. After lunch your guide will equip you, so we can set off on our kayaking leg. 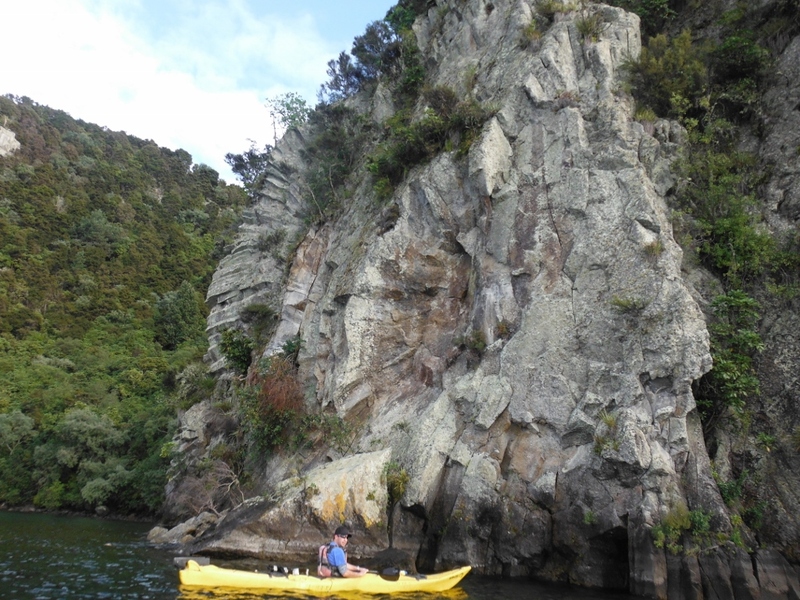 During this leg you paddle pass sheer tree-lined cliff faces that drop into the lake, while heading north towards Masons Rock which resembles a fantails tail, onto Whakaipo Bay which is one of the last untouched public and farmed reserves left on the shores of Lake Taupo. This places is so rustic and raw that you will fall in love in with it. Especially if the sheep are out. We will enjoy some afternoon tea at Whakaipo Bay, before returning back to base by road. The ride - A good climb still for less experienced or less fit riders that rewards you with everything you could want from a ride; great views, fast and flowing down hills and a workout! Please view our website under Gear List for what to wear and bring. Or click onto the following link. www.tka.co.nz/gear.php and select the appropriate tour.